Appearing in The Writing Life blog. Ultra-cool and fatally hip authors Mary DeMuth and Brad Whittington take a break from the holiday madness to trade questions about editing, the limbo-time between submitting a draft and seeing the book on the shelf, and the black art of promotion. Through the beauty of the Internet, they chat across 11 time zones, Mary in her cozy writing corner in southern France and Brad from the palm-tree shade of his lanai in Honolulu. BradW: So, Mary, how's the weather in southern France this Christmas? MaryD: Well, Brad, it's much colder than Hawaii, I can tell you that much. BradW: Shucks. I thought with all that Mediterranean influence it would be balmy. It's 9am, sunny and in the mid 70s here. MaryD: Dang. Nope it's zero here (Celsius for all you Fahrenheit folks out there). So, aren't we supposed to chat about writing? Like editing? You wrote the Fred books. Did the editing process get easier with each book? BradW: I had certain expectations when I started on Welcome to Fred. MaryD: Like that you would win a Christy? BradW: Heh. Actually, at that time I didn't even know what a Christy was. I'm curious to hear the experiences of other authors, but I expected there to be a lot of interaction between the editor and me as I developed the story. That didn't happen. MaryD: It didn't happen with me either. I was on my own. BradW: As I educated myself about publishing, I discovered that kind of editing died a long time ago. MaryD: I suppose that's why Self Editing for Fiction Writers is a good book to have. BradW: Yes, I read a book on self-editing about 20 years ago. Don't remember the title, but it was very helpful. Before then I didn't have a clue where to start. Welcome to Fred originally started as 5 short stories. Robin Hardy gave a copy to Gary Terashita. He first contacted me in October 2000, I signed a contract in March 2001 and in July 2001 I was in Atlanta for a trade show and he drove down. We talked about how I would turn 5 stories into 3 novels. Then I went back to Honolulu, knocked out 3 chapters and sent them to him to see what he thought. It took weeks to get an answer and it was basically, "Don't try to get fancy, just stick with your style and tell your story." MaryD: How did that make you feel? BradW: Relieved, actually. I was feeling the pressure to write something incredible and I didn't think my own style was incredible enough. I made some changes and sent it to him and never got any response, so I just plowed ahead and wrote the thing. As I went along with no input I adopted the perspective that it was my job to be the expert at writing and the publisher's job to get the book out. So I quit waiting for feedback and set out to write the best book I possibly could on my own. MaryD: So, then you sent Fred to Broadman & Holman Publishers and waited. BradW: Yeah. I waited, expecting some back and forth editing. However, what happened was that many months later I got the typeset pages to proofread. MaryD: Really? Just like that? BradW: There were very few changes from what I had originally written. We haggled over a few things and that was it. MaryD: Well, there you go. BradW: But I expect it's different for non-fiction. You have a non-fiction book out (Ordinary Mom, Extraordinary God) and one due January 2006 (Building the Christian Family You Never Had) and a novel coming out in March 2006 (Watching the Tree Limbs). How much editing did you endure for your books? MaryD: Three different ways, three different houses. First book: talk it through on the phone, get the final typeset pages. Second book: Edits written in the document with things like [Author: Did you want to use this word? This is a stupid word. Use mine instead.] No, not really, but you get the picture. Third book: No edits at all on the manuscript, all notes written out in a separate doc. BradW: Yes, I get those "why the heck did you use that word" questions, too. The only edited manuscript I've ever seen is the typeset page proofs with some minor things marked here and there. I sit down with The Woman and have her read the entire book out loud from the page proofs while I read what I submitted, to see what edits they made that they didn't tell me about. MaryD: Oh. That's hard. They should have a track changes document. BradW: Yes, but they barely change a thing I've written, except for normal copyediting. I will find the occasional word they've changed that I make them change back. MaryD: Well, that's cool. You must write it well first time around. Comes from writing a lot and being dedicated to the craft. BradW: Or from being good at faking it. Here's one example from Welcome to Fred. I used the phrase "of the first water" and they changed it to "of the first order." I had them change it back. MaryD: Yeah, two different things there. BradW: Yep. So, being with different publishers, you have had varied experiences. That makes sense. MaryD: The first book was very similar to your Fred experience. Harvest House didn't have a lot of edits. I talked or emailed them through with the editor and it went to press pretty quickly. So, I was surprised when I got back more edits for Building the Christian Family You Never Had which comes out January 2006. Lots of questions in the manuscript. But that was good. The first book was anecdotal, easy to write. The second was a very difficult book for me to write. So, I really welcomed any feedback. The editing made it a stronger book. BradW: Knowing a little about the content, I can see how it would be drastically harder to write. MaryD: Yeah, because I tell the story of my upbringing, and there are parts of that story that are very hard to tell. I have always wanted to be a novelist because I could explore difficult issues and hide behind characters and settings and plot. But, for some reason or another, I have my feet in both pools. I can say that writing nonfiction, especially when the subject matter is personal, is very, very difficult to do. BradW: Lisa Samson said writing historical romances was like pulling teeth, but when she changed to contemporary it was still like pulling teeth, but now they were her own teeth. Meaning it was more personal and more painful. MaryD: Interesting point. Lisa rocks! BradW: Heck yeah she does! Would you say you experienced the Lisa-factor going from your first book to your second? MaryD: Oui. Yes. Pulling my own teeth. Which hits home because I had to have a root canal IN FRANCE this year. Not so much fun, I can assure you. BradW: Ha! Not to laugh at your pain, but Ha! To go completely off topic how, different is dentistry in France? BradW: Sheeeeeesh! I'm cringing just thinking about it. MaryD: Ooops. I mean no laughing gas. I did have Novocain. They're not completely barbarians! BradW: Only partially. Speaking of laughing gas, how does Lisa's statement compare with your different experiences from Book1 to Book2? MaryD: Book1 was easier to write and edit. Book2 was harder on both accounts, but I feel like the impact this book will have on the Kingdom will be much bigger (by God's grace of course). Maybe I'm a masochist, but books born from pain and authentic human experience (whether novels or non-fiction) impact readers. MaryD: But the emotional price I paid for that book was high. Thankfully, God kept at me to write it; otherwise I would have abandoned it. BradW: Well, as I always say: Authenticity is essential. If you can't fake that, you'll never get anywhere. BradW: Holy cow! Pardon me, but I was surfing your blog while you were typing and I see have a Korean version?!?!? MaryD: Oh, yeah, Korean. I'm quite multilingual, you know. Now that I live in France I can speak millions of languages. It's amazing really. MaryD: Let's talk about saying goodbye to Fred. How does it feel to be done with Fred, Texas? BradW: I haven't thought of it in those terms. MaryD: I ask because I got sad when I finished writing my first novel, like I'd miss my characters. BradW: I wrote what I needed to write about it, and then I was done. MaryD: You're so man-ish. Compartmentalize it. BradW: Oops, I guess I am. I had that experience in the middle of Welcome to Fred. Mark moves from Ohio to Fred. It's a sudden, unexpected move that he resents. I had developed his friend, M, to the point that when it came time to take the plot to Fred, I didn't want to go, either. BradW: I was really upset about having to abandon the character. But, hey, the contract was for a kid growing up in Fred, Texas, not Ohio. So I had to go there. MaryD: Yes, that's true! That Gary Terashita's a real stickler. BradW: Heck yeah! Speaking of sticklers, have you received any editorial feedback that you strongly disagreed with? MaryD: The first book, no. For the novel, Watching the Tree Limbs, I received 22 pages of edits. Single-spaced. Most of what she said was right. A few things I didn't agree with, so I nicely argued my point. BradW: How did that turn out? MaryD: They accepted my take on it. BradW: So there wasn't strong resistance. MaryD: There were some things I could've pressed but didn't. I think there wasn't strong resistance because I was trying to be Suzie-Christian-Sweet-Author person, trying to be easy to work with, so when I did deviate, they seemed pretty open. BradW: Well, there you go. I haven't taken that route. MaryD: So, you weren't Suzie-Christian-Sweet-Author person? BradW: I'm not sure the folks at B&H would describe me as "easy to work with." Or maybe they would. Who knows? MaryD: Gary? Where are you? Gary? Do tell, Gary! BradW: Gary ran away to Time Warner. Perhaps I chased him off. MaryD: Oh yeah, he's working with my-agent-formerly-known-as-chip. BradW: Gary and I went around a few times on Living with Fred. MaryD: How did that go? BradW: I had to rewrite the last chapter twice. But before I did it, I forced him to admit the first version worked for the story. It just didn't work for the publisher. In the original, Mark bought the beer for the graduation party. MaryD: Mark! That dog! In France he'd buy the wine. BradW: I moved the scene to the middle of Escape from Fred where it worked even better. MaryD: My editor nixed a few scenes from Tree Limbs that appear in the second book. That's the glory of a series. BradW: Yes, there's always another chance to resurrect your slain darlings. MaryD: Where do you see your novels? ABA? CBA? CIA? BradW: What I've written so far, the Fred books and the Matt Cooper books, they're solidly CBA in that the Christian content is very up front. And I use a lot of Christian fiction clichés in the first two Fred books. Which I like to think I transcended. The clichés, I mean. MaryD: Good. Clichés are bad. Unless you transcend them. BradW: Exactly. Sting has written some incredible songs starting with clichés. I have a back burner project to do a series of whodunits. It will be ABA. Very ABA. MaryD: I know you haggled on your cover for the third Fredski book. How did you resolve the great chicken cover caper? BradW: One thing about the Fred books is they have incredibly great covers. Which the author has no control over, of course. MaryD: I know. But do tell. This is an exposé, you know. BradW: On the first two covers, I had minor comments, some of which they heeded and some of which they didn't. For example, on Living with Fred they had a newer Coke can with the tab that stays on. I pointed out that in the 70s the tabs came off. So they changed it. MaryD: Oh, good one. I remember getting all those warnings about peeling off the tab and putting it in your can. Good catch. BradW: On the other hand, I complained many times about the pink sky on that cover, thinking it looked too girly and romance-novel-ish. They didn't change that, as you can see. MaryD: Ah, but Brad, now you're in touch with your feminine side. BradW: Let's just say you shouldn't ask me to choose your wallpaper. So, Escape from Fred came along and they sent me the cover they were all in love with. I absolutely hated it. MaryD: The chicken cover? As in, why did the chicken cross the gravelly road? BradW: Yes, as in "Why did the chicken leave Fred?" I violently and vehemently hated it. MaryD: OOOOOH. You must. Using two adverbs like that. BradW: I'm completely out of control on the subject. They thought it was very clever. Everybody there loved it. BradW: Yes. They tried their best to talk me into it. I threw a fit. It became the one hill I was willing to die on. They said, "We have this other cover, but everyone likes the chicken better." And they sent me a wonderful cover that I loved instantly. I said, "This is perfect." And they said, "We still like the chicken." BradW: Oh yeah. So, Paul Mikos, then Marketing VP at Broadman & Holman, came up with a great idea. Have an online survey and let the Fred readers pick the cover. Their decision, whatever it was, to be final. MaryD: Did you pad the vote? MaryD: Well, you're someone who says doodah. What else could I think? BradW: Broadman & Holman put up a web page where people could vote and I sent out an email to my FredNotes list telling folks they had a chance to pick the cover of the next book. And, if you must know, I didn't say anything about the covers or which I preferred. BradW: My confidence in my readers was not misplaced. They picked the car 2-to-1 over the chicken. BradW: The chicken cover can be seen by mousing over the car cover at www.fredtexas.com. MaryD: I like the feet-out-the-window cover better. Much better. BradW: But, I must point out that Broadman and Holman didn't have to accommodate me on the cover. MaryD: This is true. I'm glad they did. BradW: It is to their credit that they went to those lengths to come to a resolution that was agreeable to the author. MaryD: Because they LOOOOOOVVVVEEEED you. BradW: Oh yeah. They love me, baby. MaryD: Because you're not difficult, right? MaryD: Here's where I am right now. The book's been written, edited, endorsed, printed and is ready to rumble. Now comes the publicity element. Do you have any advice to give me in dealing with radio? Print media? Promotion stuff? MaryD: Thanks, I feel much better now. BradW: Good. My work here is done. MaryD: The reason I ask is that book number one didn't have a publicist. But book number two and the two novels coming out this year do. So, I am readying myself for interviews. How did you handle that? BradW: Well, aren't you special? BradW: I can't even spell publicist, much less have one. OK, OK, if you want to be serious, I can count the interviews I've done on one hand and still have fingers left over to pick my nose with. MaryD: [Laughing] I guess that makes sense with fiction. But I do have a fiction publicist (NavPress ROCKS!). BradW: Go ahead, rub it in. Broadman and Holman hooks up with a company that does a radio show interviewing novelists. I've done that twice, once for each of the first two books. But I've never heard a radio station that runs the show. Of course, I don't listen to radio, so that might have something to do with it. MaryD: Yeah, you think? So, here's an aside to the listening audience. Listen in Detroit in January 2006. Sometime, somewhere I'll be talking. BradW: Oh, I forgot. I did one live radio spot in Honolulu. It was the morning drive show. MaryD: Well, at least I won't be alone, then. MaryD: Here's another question. Who is that kid on your website. Tell me that's not you. BradW: It's not me. But I'd love to meet the guy. He's on the cover of Welcome to Fred. Great picture. MaryD: I didn't think so. You ought to get some horned rims though. They're all the rage in France. BradW: I'll look into it. MaryD: Good. I'm looking out for your image, Mr. W.
BradW: How about book signings? What has been your experience? MaryD: Well, er, not many English Christian bookstores in Francy pants. I did have one when I flew home in March. It was a successful one, sold over forty books. BradW: That's a good signing. Getting in double digits is good for non-celebs like us. MaryD: Yeah, but I neglected to mention (in my ego-pride-ness) that it was my mega-church's bookstore and they publicized well. You? How many? BradW: I did three booksignings in Texas and one in Honolulu for Welcome to Fred. For Living with Fred I did one at my church in Honolulu and one at the coffee shop where I wrote Escape from Fred, Common Groundz Cafe in Hawaii Kai. My experience is that the only people who buy a fiction book at a signing are people who were planning on buying the book anyway. Also, promoting for fiction and non-fiction is very different. MaryD: Yes, that is true. Non-fiction is all about platform and branding, baby. But I'm naughty. My poor agent doesn't know what to do with me. BradW: Uh oh! No presents this Christmas. MaryD: Coal this year from Pere Noel, I'm afraid. BradW: OK, spill it. Wherein lies your naughtiness? MaryD: I'm Anakin Skywalker, baby. Going to the dark side. From writing parenting books to venturing into risky faith. MaryD: I'm writing my last parenting book this winter and then it's on to other things. Radical Christianity. How to exegete American from Christianity. Stuff like that. BradW: Aha! The veil slips from my eyes. All is clear. MaryD: Not that anyone's bought anything yet, but I'm ruminating. BradW: Well, Donald Miller doesn't seem to be having problems so the time may be right. MaryD: No, he doesn't. And here's the thing about the Donald: He didn't sell much-a-nothing his first year. That is, until colleges picked up Blue like Jazz and went nutty. Now it's a bestseller. So, if we can venture into marketing, here's my thing. I think Malcolm Gladwell is onto something. He wrote The Tipping Point. It's about getting your product (in this case your brilliant books or my tell-all tomes) into the hands of folks who will chat about it. BradW: Yes, that is the key. MaryD: They tell two friends, and they tell two friends, and so on and so on and so on. BradW: So one hopes, at any rate. MaryD: So, creating a great influencer list is important. I'm working on mine right now for the novel and the parenting book. And one guy, a good friend, has agreed to send the parenting book to 24 of his high-profile buddies. You just never know. BradW: True. The problem is I, and many others like me, don't have any high-profile buddies. Or even any buddies who do. MaryD: Yeah, me neither. Maybe after Britney and Jennifer and the Donald read our witty posts here, we'll be in. BradW: I've wasted my life avoiding connected people. I'm a connected-o-phobe. MaryD: You gotta get some new buddies! You will if you wear horn-rimmed glasses. BradW: Gotta get the glasses. Speaking of glasses, it looks like it's time for my coffee. As a night person, I'm amazed I've been coherent this long doing an interview in the morning with nothing but rooibos tea to sustain me. MaryD: I'm not a night person, so I'm tired too [since it's nighttime in France]. I need to turn in. By the way, I have one last question for you. MaryD: "Why did the chicken cross the road?" BradW: That's easy. To prove to the armadillo that it could be done. 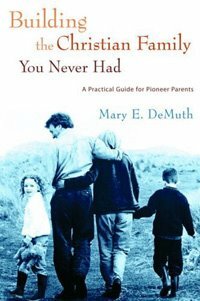 Mary E. DeMuth has been crafting prose since 1992, first as a newsletter editor, then as a freelance writer, followed by a fiction and nonfiction author. Mary's articles have appeared in Marriage Partnership, In Touch, HomeLife, Discipleship Journal, Pray!, Bon Appetit, Kindred Spirit, P31 Woman, and Hearts at Home. For two years she penned a lifestyle column for Star Community Newspapers in Dallas (circulation 100,000). Mary's books include Ordinary Mom, Extraordinary God (Harvest House, 2005), Sister Freaks (Time Warner, 2005, one of four contributing authors, Editor Rebecca St. James), Building the Christian Family You Never Had (WaterBrook, 2006), Watching the Tree Limbs, and Wishing on Dandelions(NavPress, both novels releasing in 2006). Mary loves to speak about the art and craft of writing as well as the redemptive hand of God in impossible situations. She's spoken in Munich, Vienna, Amsterdam, Portland, Dallas, Seattle, and San Jose. A thirty-eight-year-old mother of three, Mary lives with her husband Patrick in the South of France. Together with two other families, they are planting a church. Brad Whittington was born in Fort Worth, Texas, on James Taylor's eighth birthday and Jack Kerouac's thirty-fourth birthday and is old enough to know better. He lives in Austin, Texas with The Woman. Previously he has been known to inhabit Hawaii, Ohio, South Carolina, Arizona, and Colorado, annoying people as a janitor, math teacher, field hand, computer programmer, brickyard worker, editor, resident Gentile in a Conservative synagogue, IT director, weed-cutter, and in a number of influential positions in other less notable professions. When he isn't writing he does what he can to impact the productivity of his fellow workers in the telecommunications industry. He is greatly loved and admired by all right-thinking citizens and enjoys a complete absence of cats and dogs at home. Brad won the 2004 Christy Award for Best First Novel, Welcome to Fred.